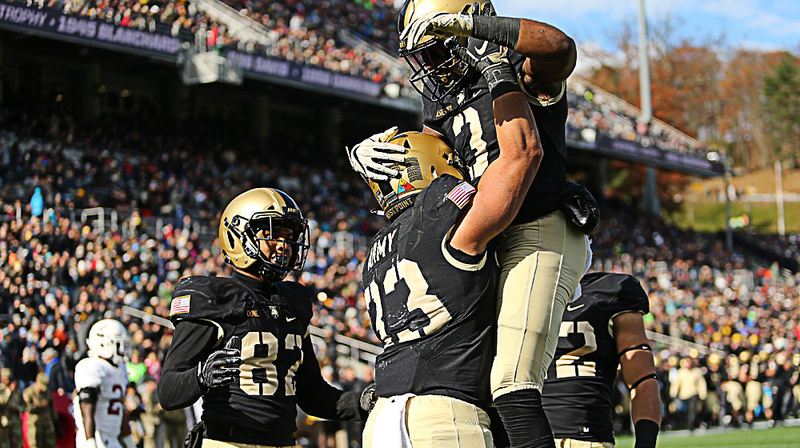 The Army West Point football team extended its winning streak to six games following a 31-13 victory over Lafayette here Saturday afternoon. WEST POINT – The Army West Point football team extended its winning streak to six games following a 31-13 victory over Lafayette here Saturday afternoon. The Black Knights have now won their last 12 games at Michie Stadium, their longest such streak since winning 13 in a row from Oct. 31, 1987 to Oct. 28, 1989. Fullback Darnell Woolfolk led the ground attack for the third time this season with 69 yards on 12 carries and two touchdowns. Cam Thomas added 51 rushing yards, while totting the ball seven times. Quarterback Kelvin Hopkins Jr. rushed eight times for 22 yards and a score, in addition to going 5-of-6 for 95 yards through the air. Glen Coates and Christian Hayes each hauled in a team-high two passes, while Coates and Calen Holt both recorded a reception of 30-plus yards. After their eighth win of the season Saturday, the Black Knights have won 18 of their last 23 games dating back to the start of the 2017 season. Head coach Jeff Monken also has his team 18-3 in day games the last two years, including an 8-0 mark this season. The Black Knights used the opening 10:19 of the game to march 67 yards and take the early 3-0 lead after Abercrombie’s 25-yarder. The drive had its struggles though as the Black Knights fumbled, but they were fortunate to recover, and were penalized two for a false start. Despite getting stopped on their opening drive of the game with a 3-and-out, the Leopards quickly got the ball back after a fumble on the punt. Lafayette recovered the loose ball at the Army 23 and were within striking distance to take the lead. Fortunately the Cadets’ defense held their opponent to just a 42-yard field goal to knot the game at 3-3. The Black Knights broke the deadlock with a Woolfolk one-yard touchdown rush early in the second quarter. That drive totaled 75 yards on 10 plays and handed Army the 10-3 advantage with 12:26 left to play in the half. The Black Knights made it a two-score game and extended their lead to 17-3 after Holt scampered in from the 8-yard line for the score. A few highlights from the drive were big yardage plays from Artice Hobbs (pickup of 18 yards) and Cam Thomas (rushed for 20 yards). Holt’s touchdown capped a 12-play, 94-yard drive that latest 6:37. Lafayette cut into the advantage with a 43-yard field goal just before half that trimmed the Black Knights’ lead to 17-6. The Leopards used just 35 seconds of the clock to go 35 yards on six plays. Lafayette was forced to punt after its opening drive of the second half. The Cadets got in on the coverage and Davidson blocked the kick. Mike Reynolds recovered the bouncing ball and ran it back to the 1-yard line. One play later, Woolfolk crossed the goal line to make it a 24-6 Army lead. The Black Knights then added on again when Hopkins, Jr. registered a two-yard rushing touchdown late in the third period. The Cadets rushed five-straight times at one point during that drive which concluded at 11 plays and 77 yards. Looking to trim the lead, Lafayette quarterback Sean O’Malley connected with fullback Will Eisler for a three-yard touchdown midway through the fourth quarter. The Leopards’ gunslinger capped off a 12 play, 75-yard drive that took 7:07 off the clock. This sequence would serve as the final scoring drive of the contest for either team. Army is back in action this Saturday when it welcomes Colgate for a noon kickoff at Michie Stadium.